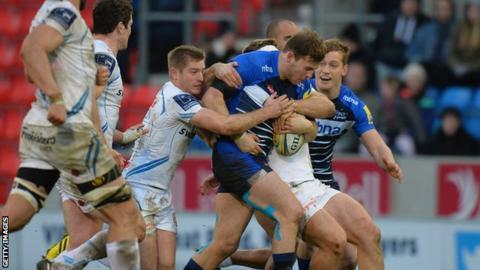 Exeter Chiefs boss Rob Baxter says there is "pressure" on his side after a second successive Premiership defeat. Following last week's narrow loss to leaders Saracens, Chiefs were beaten 23-17 at Sale Sharks on Saturday. Exeter, who travel to London Irish next week, are still second in the table, seven points clear of third place. "There is a little bit of pressure on us, but we have to make sure that pressure comes out positively and we play with great energy," said Baxter. It was the first time that Exeter have lost back-to-back Premiership matches since January 2014, when they went on a run of four successive losses that ended up costing them a chance of making the play-offs. "We were one decision last week away from winning the game, that's how tight it was against the team top of the Premiership," Baxter told BBC Radio Devon. "Losing away to Sale with a losing bonus point, who haven't lost here all season - if you look at them in the course of a big season, they're not major things. I'm not going to suddenly go 'two losses means everything's falling apart', it's not. "But the reality is we do have to go and win at London Irish, because that's a team we should knock over if we want to be a top-four side."